This review is for Your Name, a novel by Makoto Shinkai. The English translation of the book was released in May 2017. Shinkai was also the director of the Your Name animated film, which was a pretty big hit in Japan and overseas. A bonus volume of short stories Your Name – Another Side: Earthbound will release in English on October 31st. I’m a big fan of most of Makoto Shinkai’s films. The feelings of the films’ characters always seem to resonate with me, and are portrayed in an introspective and quiet manner that feels stronger than is typical of an average drama. Five Centimeters Per Second is my personal favorite, and one of my favorite films period. Garden of Words and The Place Promised in Our Early Days are both wonderful. I also liked the recent mini-series for She and Her Cat quite a bit. Your Name is a good one too. I wasn’t quite as enthralled with it as a lot of other people were, but I enjoyed it and recommend it. I can also see why that was the Shinkai film to resonate with a massive audience, as opposed to his previous works. To put it simply, it’s both a happier story and a more exciting story. 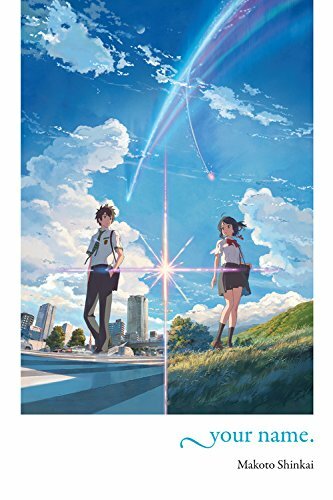 The novel of Your Name, which actually released in Japan a couple months before the film released in theaters there, shares pretty much the exact same plot as the movie. There isn’t much in the way of “new” material in the book, so I honestly wouldn’t call it a must-read for those who have seen the film and are looking for more. That said, the book is still a good read. You can consider it another pleasant way to experience the story. And for those who haven’t seen the movie yet, it might be fun to try the book first? It’s pretty short, so it’d make for a quick read. Then you can see how all the scenes translate to the TV screen, with all those beautiful shots of clouds in the sky. Your Name is about a girl in a mountain village and a boy in Tokyo who switch bodies on random days via their dreams. At first the story appears to be a kind of lighthearted romcom with a sci-fi/fantasy twist, but the plot gets much more serious in the second half. It’s the sort of shift in tone and pacing I’d rather not spoil, so suffice to say things get pretty intense for the final act. The two protagonists meanwhile are very easy to like, and they both have good friends that play a role in many memorable scenes. My only real gripe with the story is a subplot that I felt went unresolved, or at least felt glossed over unnecessarily. The heart of the story though–the relationship between our two leads and the themes that their connection portrays–is handled beautifully. So all in all this is a good book, but I feel I’d only suggest it to those who have either not seen the movie yet, or are such big fans of the movie that they want to experience the story again in another fashion. Worth noting is that there is also a manga adaptation being released by Yen Press, if you’re interested in yet another way to enjoy the story.